Craig Hutton was arrested after law enforcement found over a pound of meth, $4,800 and several firearms in his Bruneau Home. BRUNEAU - After finding more than a pound of methamphetamine in his home, police arrested an Owyhee County man on suspicion of drug trafficking. Owyhee County Sheriff’s deputies arrested Craig Hutton after investigating drug dealing in the Grandview and Bruneau areas, according to a written statement from the office. Information from that investigation led police to obtain a search warrant for Hutton’s home in Bruneau. Deputies executed the search warrant on March 8, when Hutton was not home. 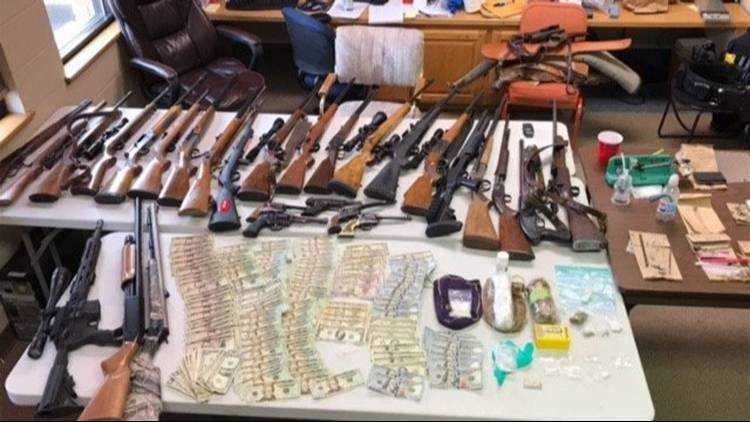 During the search, police found roughly 1.3 pounds of meth, $4,800 in cash and “several firearms,” according to the release. Deputies also found scales and packaging materials in the home as well. Officers found Hutton the same day on Highway 51, and arrested him during a traffic stop. They found an additional 6 grams of methamphetamine in his vehicle, broken down to 2-gram packages. Officers booked Hutton into the Owyhee County Jail on suspicion of felony drug trafficking, three counts of possession of a controlled substance with intent to deliver, and one count of possession of drug paraphernalia with intent to use, which is a misdemeanor. He appeared in court on March 25, but information from that hearing was not available at the time we went to press.